Last spring, the Red Sox made the acquisition of a parking garage across Lansdowne and there was some intrigue on a lot of levels. Most of them positive about what the Sox could do with the land – build a high rise that peered over the Monster, perhaps? – but there was one more question: the garage is also the backing for the Stop Handgun Violence sign that has been extremely prominent on the stretch of the Pike by the park for almost 20 years. A story in the Globe this morning quotes the head of the non-profit and owner of the billboard, who notes that he will have to take down the billboard and, if he can’t find a cheap option, it may cease to exist. There aren’t many places as high traffic – both pedestrian and vehicle – and as the conversation and cause are worthy and necessary to have in this day and age, it’d be a shame if there wasn’t a way for SHV to keep Boston in the heart of that discourse. A history of the different billboards since 1995 can be seen at SHV’s Facebook page. Hopefully they find a place that is just as prominent to continue to promote its cause and this important conversation. 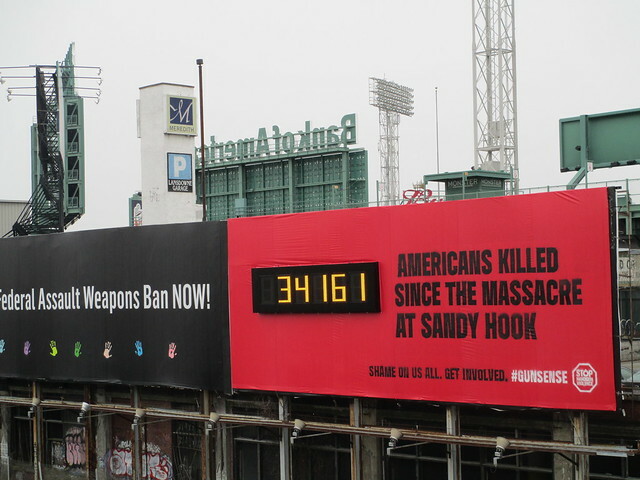 This entry was posted in Fenway by Dave Levy. Bookmark the permalink.